My name is Jean McBride and I’m getting to be a “woman of a certain age.” That’s all I’m saying about that. You’ll have to figure out what it means for yourself. And good luck, because I’m still trying to figure it out. I am a westerner, through and through. I am a Colorado native who was transplanted to Wyoming at the ripe old age of two. These days I live in northern Colorado where the sky is so blue it makes your teeth ache, and so wide it just opens your heart. I’m a writer, a mosaic artist and a family therapist. Talk about making a life out of various pieces! That’s me. I’m writing this blog because I’ve been whispered at, gently nudged and now shoved into taking a look at life, family, and the inevitable process of aging – all through the lens of nature. As my journey companions and teachers, I have the pleasure of sharing my life with a personality-plus appaloosa named Bud, and a rather persnickety (some might say crotchety) mare named Miss Pepper. Bud just celebrated his 27th 28th birthday and Pepper turned 28 29 in May. They have a lot to teach me and maybe you too. I love you so much, Jean and I am so darn proud of you! Boy, you sure are a great writer – brings happy tears to my eyes to read what you’ve done so far! I am so lucky to have you in my life! We have a mutual admiration society because I am so lucky to have you in my life too. Thanks honey for the words of encouragement. Hello and welcome to Two Old Horses and Me. I’d love to be friends! Thanks for signing up. You’ll probably enjoy my Wednesday posts – they come from our little earless cat Mija. First, let me say that I enjoy your blog. Gives me a warm feeling when I read them. Rare these days. 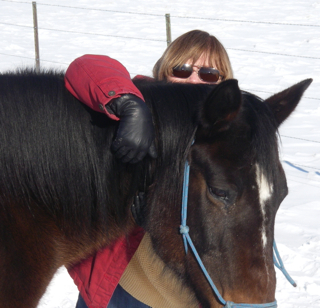 I came across your blog while researching Southern Wyoming for a novel I want to write. Similar to you, I am a “man of a certain age” having spent 40 years in advertising, writing TV commercials. I recently retired and have turned my attention to writing longer things, like mysteries and westerns. Seeing that you are quite knowledgable of Vedauwoo, I have a question for you: could a small horse ranch have existed in or very near Vedauroo in the 1700s? Is there grass (grazing) enough to breed and raise say 100 head? I’m looking for a special location for the setting of a new western I’m considering and having the magical rocks of Vedauwoo nearby would be wonderful. Thank you very much for anything you can tell me. My next step would be a research trip in person July-Aug.
to you. Please email me at: taylorepstein@earthlink.net. Like you, I’m a therapist by day and a haiku poet by night and holidays. Thank you!